This twin size Balance self adjusting mattress system features a closed system that envelops and redistributes pressure for optimal therapy. Each air chamber communicates and redistributes the patients pressure evenly over three distinct therapy zones. Since air supports the majority of the load the system is designed to last year past a standard alternating pressure mattress. The high resilient foam is encapsulated in preset air chambers with airflow control. The soft sloped foam cradles the heel to reduce pressure and sheering in critical zones. This balanced air mattress easily converts to a "hospital grade" by adding a pump for alternating pressure therapy. The additional alternating pressure combined with the self adjusting technology will help manage pain healing up to a stage 4 bed sore. This twin size Balance self adjusting mattress system features a closed system that envelops and redistributes pressure for optimal therapy. Each air chamber communicates and redistributes the patients pressure evenly over three distinct therapy zones. 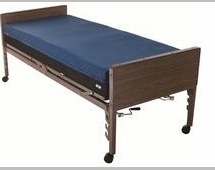 Fits standard medical bed frame. Prevents and heals up to a stage 4 bedsore. Weight Capacity 500 lbs. .